Shine Thou on us with heav’nly light. The Latin hymn “O lux beata Trinitas (O Blessed Light, Thou Trinity),” attributed to St. Ambrose of Milan (340–397), was traditionally sung in the evening at the service of Vespers. 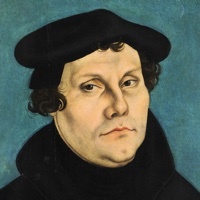 Martin Luther produced his German translation, “Thou Who Art Three in Unity (Der du bist drei in Einigkeit),” in 1543, when it appeared with no melody in Joseph Klug’s Wittenberg hymnal. In 1545, the hymn appeared with two versions of the original plainchant melody, one in Valentin Babst’s Leipzig hymnal, the other in Wolfgang Köpfel’s Strassburg hymnal. It is the latter than won out. 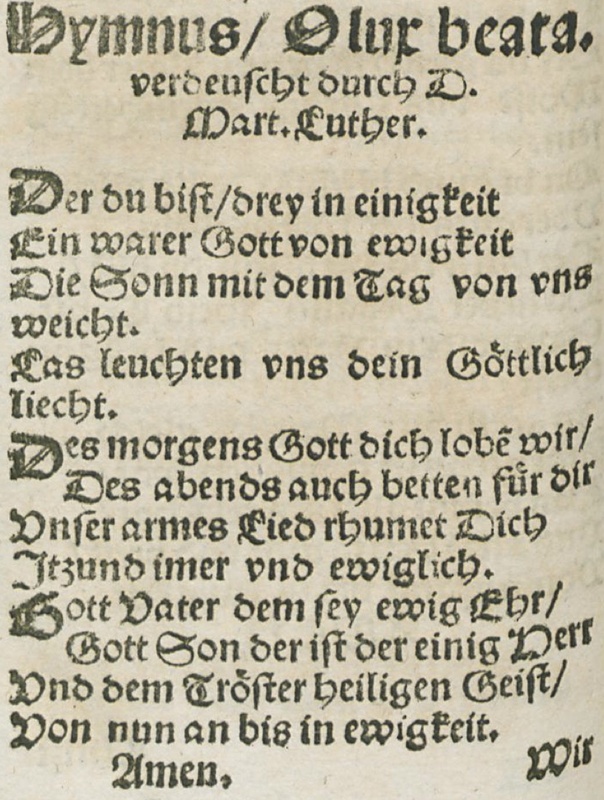 “Der du bist drei in Einigkeit” as it appeared in a 1545 printing of Klug’s hymnal. While Luther’s hymn is absent from The Lutheran Hymnal and the Lutheran Service Book , a translation by John Mason Neale from the Latin original is found in The Lutheran Hymnal , No. 564, set to Nikolaus Herman’s tune O heilige Dreifaltigket, known to English speakers through its association with the translation “O Blessed Holy Trinity.” For the Free Lutheran Chorale-Book, we have used a slightly altered version of the translation made by Richard Massie from Luther’s German. An arrangement of the plainchant melody is found in Layriz’s Kern des deutschen Kirchengesangs , and in the same form in the Mehrstimmiges Choralbuch , but it departs from the simplicity of the plainchant. We have therefore used a slightly altered version of Lucas Osiander’s setting of the plainchant melody as found in Köpfel. The text and music here provided are in the public domain. They may be freely used and reproduced for any purpose whatever, and are offered with the prayer that they may serve for the edification of Christian people everywhere.